Francoise Martinet, former principal dancer with the Joffrey ballet and professor emeritus of dance at the University of lowa, was born in 1934 in Morocco. Her early dance training took place in Casablanca, and at the age of 14, soon after WWII ended, her family moved to Seattle, Washington. 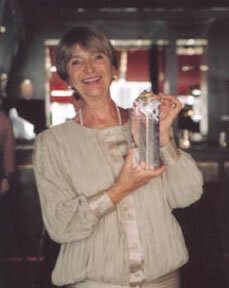 In Seattle, Francoise began studying with Mary Ann Wells, also the teacher of Robert Joffrey and Gerald Arpino. While Joffrey and Arpino had graduated and moved to New York the year prior to Francoise’s arrival in Seattle, Joffrey met Francoise at an audition and offered her an open invitation to look him up in New York. Though Francoise’s plans were to study in Paris, she would remember the invitation. In Paris, Francoise studied with Madam Mora Kies and danced for the Follies Bergere. After three months, Francoise returned to the States and contacted Robert Joffrey. Thus began her ten­ year career with the Joffrey Ballet. Among her most noted performances were the Goddess in Robert Joffrey’s Pas des Deesses and the Amazon in Lew Christensen’s Con Amore. With the Joffrey Ballet she became known for her theatricality and wit. In 1965, after finishing a successful world tour, Francoise decided to retire. In 1978, Ms. Martinet became a member and Chair (1987-91) of the University of lowa Dance Department where she choreographed and re-staged many works. Franooise was a beloved teacher at UI for over 20 years. In 1998, her decision to retire caused an outpouring of well wishes and testimonials from students and colleagues. Ms. Martinet travels throughout the US and abroad as a restager, adjudicator and guest teacher.